If you read this dont worry!! Its a Vent!! But Im attempting to hide nothing. I typed this out about a year ago. Im not feeling it today. I really dont have that take on the world attitude today. Nor to I feel good about where my life is going. Never really confronted what I was scared of until fairly recently. Never been comfortable in my own skin…yah dont think many people are as well..but I cant help but think I have it different. My 18yr old self would not know who I am. Different. Better. But not good? I know someone always got it worst and trust me Ive seen some things. Yes Im grateful EXTREMELY grateful…of what I have. but in all honesty I think I would not hesitate if given the opportunity to trade. This is selfish of me to say of course. Envy the fact that you can walk in a room without thinking twice about it. Envy the fact that you dont have that naggin voice in the back of your head saying that their making fun of you. As harmless as it may sound to you…thats probably what hurts me the most. the innocence of children. and its tough cuz I have good good peeps in my life that want nothing for me to succeed….and I’m hampered in my own self doubt. I dream big. I have high expectations for myself. I want to be an example of how to be to my younger cousins, nephews & nieces….I dont want them to feel embarrassed of me. to be uncomfortable introducing me to their friends…I want them to be proud of me. I know sometimes I like going without thanks. but sometimes it feels real good for someone to acknowledge me. It pushes me through rough patches. Sometimes I believe I wronged someone in my past life…and karma put me on this path…. Im “like” normal….lol like a defective sweater you buy at first you see the defect…figure is not bad…..wear it love it…and only notice it when you look. And its hard for anyone to understand. I guess you would have to see it through my eyes. And as I sit here… typing this out im in tears…tomorrow is another day. Categories: Everyday Nonsense, This Shi# Just Got Real | Permalink. so this post was supposed to come on monday..but I knocked the eff out cuz of my meds. So ok…Monday was wack as usual, but during my week I guess you can say I look forward to lunch. I making an effort to at least try something new maybe 2 or 3 times a week. Makes the weekend come sooner I guess. Aight back to food so I see this place everytime we head towards McD for lunch. “Absolutely PHObulous” shiet…with a name like that it deserves a try right? 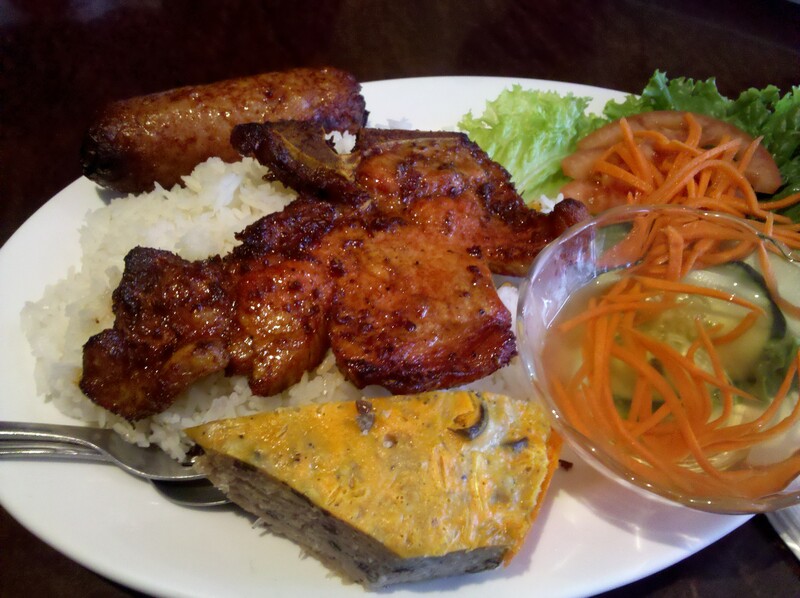 Well Vietnamese food in general has been one of my favs Banh Mi, PHO soup w/ everything + tripe and tendon lol, pork chops with the rice meat loaf thingy and the fish sauce, spring rolls..you get the picture. So I got the chance to try this joint since is 5mins from my place of work..hoping that it would be good enough to keep me away from traveling to Victory & Sepulveda for some of that Pho 999. Ok just kidding honestly I was watching The Great Food Truck Race and the Nom Nom girl Misa got me craving some Banh Mi, and I figured pho 999 didnt have em….so I took a risk and figured that this spot had a good chance…. 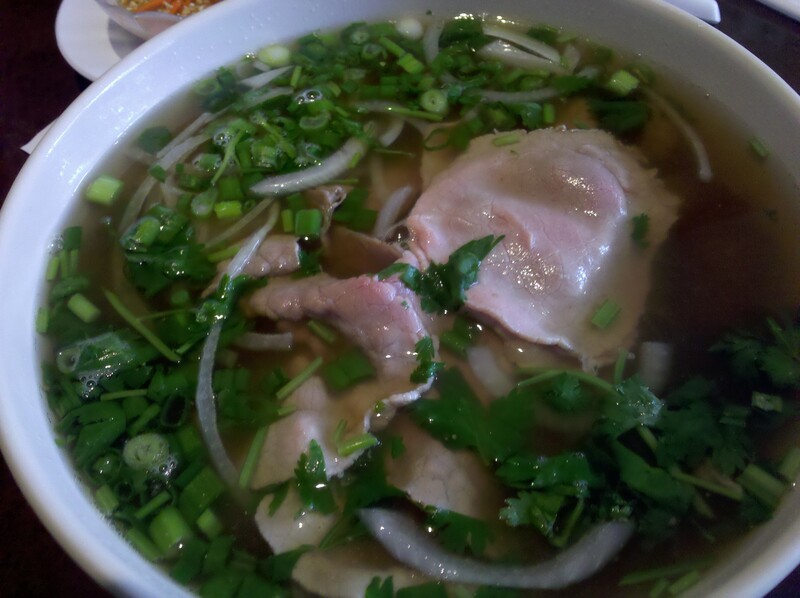 further more the possibility of a good Vietnamese restaurant near work just seemed like the perfect opportunity to go on a food adventure…..and yah they had a good Yelp rating! They had minimal options on the menu compared to what youre used to if you have ever been to a Vietnamese spot, but I feel like they just streamlined it…I will do some further investigating. They had minimal options however they had Ham, chicken and marinated pork. 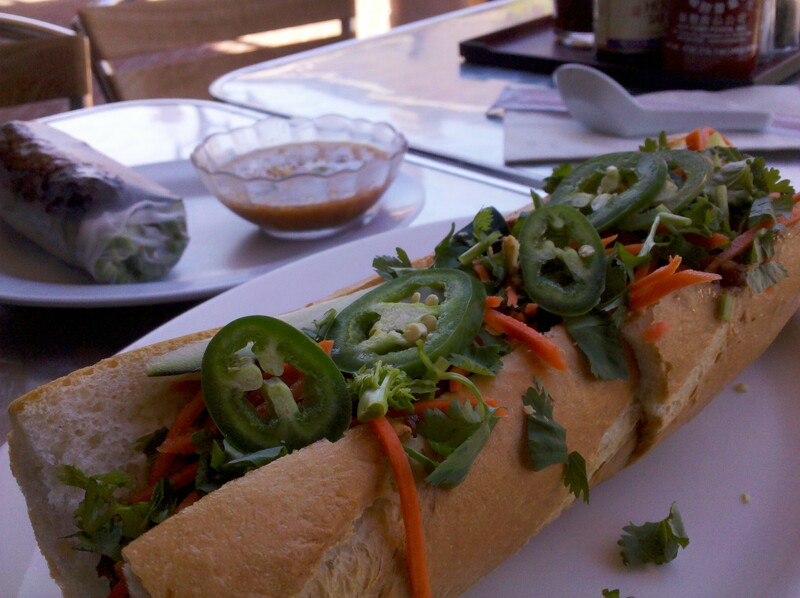 I ordered the marinated pork..cuz thats the go to banh mi for me =P. They had Ham, chicken and marinated pork Banh mi meat choices available (maybe more I cant remember =P) I ordered the marinated pork..cuz thats the go to banh mi for me =P. So the verdict: Its good…The pork and the bread is delicious… but the rest of the sandwich was missing something, maybe they didnt have it that day..but that pickled white veggie they usually put in there wasnt in and something else..not quite sure tho. I also ordered a Royal Spring Roll? forgot what actual name they have. 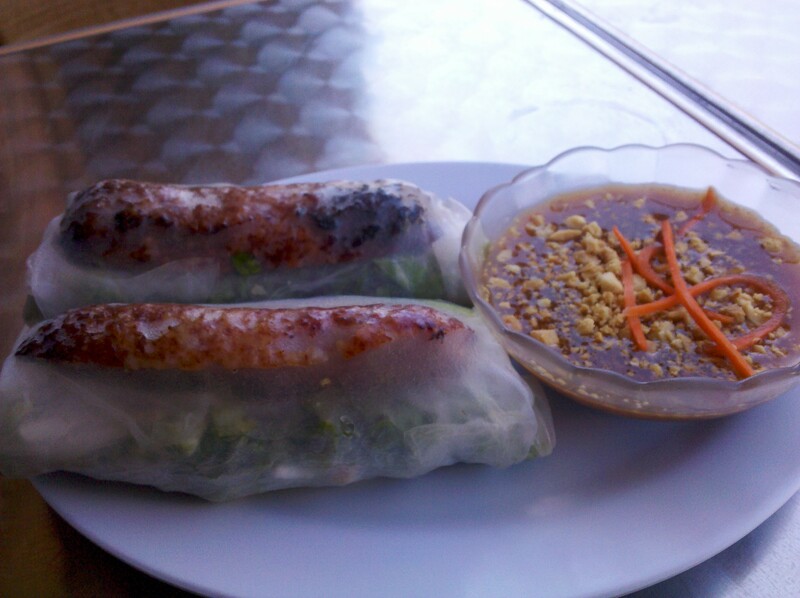 its basically a spring roll with a marinated sausage instead of the shrimp comes with the same sauce. This was so good!! what can I say a spring roll with a sausage lol!! Ok..place deserved a second try and since it was gloomy and cold outside (perfect pho weather) decided to have a hot bowl of there beef pho. and I’m relieved to say that it was good! Cuz what kind of pho spot has crappy pho? broth, noodles, meat all good definitely got the comforting effect Ive been starving for lately. you think im done? hell no lol. as you can tell from the pic it looks good lol…but I cant say if it was or not..my bro says its missing something and doesn’t elaborate on much else.. he was disappointed it didn’t come with the shredded beef stuff usually on the rice..but I feel like the pork sausage was the substitute…he also mentioned something about not enough fish sauce….dammit shoulda tried some. some things tho…not big on bashing service but they are slow…givin it was busy today ..it took a while just to order usually at vietnamese spots its like bang bang youre in then youre out (get your mind out of the gutter perverts). I got Pho and it was last to come out..figured I would get it first.. I think we spent almost an hr in there. Ive driven to pho 999 from work to eat and was back in the same time (10-15 mins away, my work is 5mins away). Also…I was there monday as well, by far less busy..pretty slow actually, I spent about an hr as well…only real qualm with the place. overall the spot is an 7.5/10 ..score could change im gonna be there more often. Categories: Everyday Nonsense, Food!! | Permalink. Finished off the night by hitting up a boba joint a few blocks away called half and half. typical joint good boba prepared properly chewy but not to chewy, you feel? Got a coffee slush with boba not big on coffee but it was good. kept me awake on the trip home curbed the msg coma. Strangely however place smelled like a pet store? I wonder if they got hamsters running on wheels to power the joint? Categories: Everyday Nonsense, Food! !, This Shi# Just Got Real | Permalink.